Cleaning laminate floors can be done easily and efficiently with only a little effort on your part. After installing your laminate floor, you may have some questions on how to clean it properly. Do I need to buy a special cleaner? If so, which one? Can I just wipe it with water? Doesn't water damage laminate floors? Does it matter which direction I scrub? These may be some of the questions that you would ask yourself or others when determining how to clean laminate floors. Even though laminate floors are extremely durable, they too will need a cleaning every now and again. 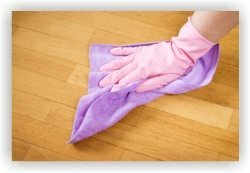 When cleaning laminate floors, you can do the "preventative maintanance" by sweeping and vacuuming using the hard floor attachment. Do not use a "beater bar" or any rotating head on your vacuum, this will most likely scratch your flooring. I have found that if you have a good microfibre dry mop and some hot water with a touch of white vinegar (use a 4 to 1 ratio), you should be able to keep your laminate floor squeaky clean. You can use use a window cleaner like "Windex" for a cleaner if you wish but I find for the most part it is not needed. Ensure that when cleaning, to go in the direction of the seams or grain of the pattern. This will make it easier to get the dirt out of the seams instead of packing it in the cracks. When using the water and vinegar mixture, make sure you have a dry towel to dry the floor right away as you know that water is public enemy number one for laminate floors. Never use an abrasive cleaner or scouring pad. There is no need to wax or use a mop and shine product for your laminate floor. These products will damage your floor. Do not use a furniture polish like "Pledge". Although your floor will look beautiful, you may have a few lawsuits come your way because the floor will be as slick as ice! Grease: Put an ice pack (or frozen veggies) on the spot until the grease hardens. Gently scrape off the majority with a plastic knife. Window cleaner should get the rest. Blood : Window cleaner works great to remove blood. Just spray and wipe! Crayon : Use a soft cloth with a little drop of mineral spirits. I was also told that toothpaste and a dry cloth will work as well. There, cleaning laminate floors isn't too hard is it? You will have no problem keeping your floor looking it's best!